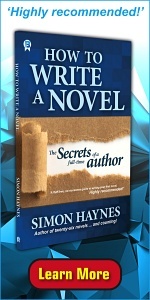 For information on the Kindle editions of these books, click here. I was about 11 or 12 when I finally read the book. By this time my family had shifted to Spain, so real life was already pretty exciting. Books had to be extra special to compete with a new culture, a new language and a new school. This was also my first taste of Science Fiction, and many have waded into lurid-looking books only to founder on dry technical details. However, this was different: the heady combination of outer space, life-or-death adventure and intelligent, scientific characters made the Famous Five and Just William look as believable as a Punch and Judy show. Martin Magnus wasn't space battles or Zap! Kerpow! sci-fi, it was about a troubleshooter who could be driving a six-wheeled buggy over rugged Moon terrain in chapter two, strolling the ocean floor in chapter four and flying to Venus by chapter seven. He was competent, confident, wilful, allergic to bureacracy and interference from his 'betters' and intolerant of pompous, self-important twits. To a 12-year-old schoolboy suffering in the Spanish school system, he was a hero. 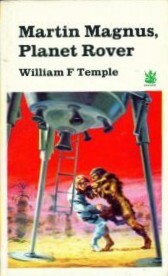 After reading the book several times in a row, I realised there was another book by the same author (it was mentioned amongst the publisher guff in the front of 'Planet Rover', but who reads the pages before 'Chapter One'?) Apparently, the sequel was called 'Martin Magnus on Venus'. Now, we'd been living in Spain for two or three years by now, and I'd seen ONE Spanish novel in the eight years I lived in that country. That was an Isaac Asimov translation which someone gave me for a birthday present. We didn't even have a telly, with only one channel of dubbed John Wayne movies it wasn't worth it. And don't ask me what everyone did in their spare time... Although I did notice a tendency for large families amongst the locals. Anyway, ex-pats ran the occasional jumble sale or flea market. These were rare, probably because the Guardia Civil (policemen with machine-guns, jackboots, steel helmets and attitude) were convinced they were hotbeds of stolen gear. All right, so one year a couple of crooks cut down a vanload of baby pines from a plantation and tried to sell them as 'Christmas Trees', but most of the stuff was plain old junk. They didn't sell any, by the way - It wasn't that the guys were crooked (everyone was, I think), but the 'Christmas Trees' came complete with white silken pods the size of oranges, stuffed with writhing black caterpillars. The point is, with the limited shopping options at my disposal I had as much chance of getting hold of a particular book as I did of flying to the Moon. Found it! I dug out my spare cash and moments later the book was mine. I swear I'd finished it by the time we'd driven the 15km back home, at which time I probably read it another three or four times just to memorise the bits I hadn't already got clear. Then, no doubt, I would have read the first one again for the complete experience. My collection was complete. Bliss! Fast-forward 15 years or so, to the year 2001. I was now living in Australia, having emigrated with my parents in 1983. By 1995 I was working on my first novel, part of a planned series about a wilful space pilot, a man allergic to bureacracy and interference from his 'betters' and intolerant of pompous, self-important twits. He wasn't a Magnus clone, though - Hal Spacejock is totally incompetent. I like to feel Hal's attitude towards tiresome rules and regulations would allow him to share a beer with Magnus at the local without coming to blows. Back to Magnus. Of the 400+ books I managed to scrape together during my seven or eight years in Spain, thanks to weight limits and a suitcase the size of a school lunch box I was only able to bring a couple of books with me to Australia. I still have them - and no prizes for guessing which I chose. Anyway, whilst browsing the internet one afternoon I decided to look up William F. Temple, to see what else he'd written. The Magnus books were great ... what if he'd written dozens of other novels for me to track down? I found a few titles, then stopped. Can you imagine my slack-jawed surprise when I discovered there was a third book in the Martin Magnus series? There it was on the screen: 'Martin Magnus on Mars' I checked both my Mayflower Magnus books, but neither of them said a peep about Mars. The covers didn't have subtle hints like 'Book Two in the Martin Magnus trilogy' or 'Look out for part three, coming soon!' 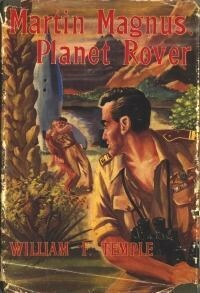 Puzzled, I returned to my computer, where I discovered that the Magnus books were originally written in the 1950's, and that Mayflower had only bothered to reprint the first two in the series. There's a special place in hell reserved for the penny-pinching bastards who dreamt up that little twist, I can tell you. Where would the Lord of the Rings be if they'd dropped the third book? Who could possibly have enjoyed the 'Matrix' films if they hadn't made the third one? Ok, bad example. Actually, I can understand their motives. When it comes to printing books, no publisher wants to lose their profit on warehouses full of unsold copies. Therefore, they release the first in the series and watch the figures. When they release the second, they print a quantity equal to however many sold of the first (in rough figures). So, if they print 5000 copies of book 1, and it sells 2000 (with 3000 remaindered or pulped), they print 1500-2000 of book two. It's logical really, you're unlikely to get more people buying book two than bought book one, and if you factor in all the people who bought book one and thought it stank you can see that you'll need less of book two than you did of book one. Now, what happens if you only sell 500 copies of book two? You go ahead and print 300-500 copies of book three, right? Wrong! You don't print book three at all, because it's not worth printing less than a thousand copies of anything. Thus, you right royally annoy the 500 people who are avidly following the series, but you hope they'll switch to Dr Who or Star Wars tie-ins instead. So, that's my guess on what happened with the Mayflower 'Magnus' books. I have doubts, though, since the two titles they did publish refer to each other and not Mars. They were also published in the same year, 1970, which wouldn't have given them time to guage the sales of the first book before releasing the second. OK, on second thoughts the publishers WERE a pack of penny-pinching bastards. Enter eBay, the perfect tool for hopeless nostalgics and avid collectors of obscure stuff nobody else wants. In those days you could set up three searches which would automatically email you when someone listed matching items. (Nowadays it's 100 searches. They're taking all the fun out of it.) I put in several combinations of William F. Temple, Martin Magnus and Mars, and pretty soon I discovered that everyone else only had the first two books as well. 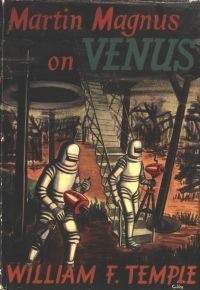 I did manage to pick up 1950's first editions of Planet Rover and Venus, as a kind of consolation prize, but Mars remained as unattainable to me as it did to the ancient Greeks. Magnus appeared now to be thrusting his thin face, with its narrow brown eyes and narrow beak of a nose, into every corner of the console, scanning the meters and peering through inspection ports. His bony, large-jointed fingers did a sort of skeleton dance over the switches, knobs, buttons and levers. For a man that knew nothing about radar trackers, he conveyed a surprisingly convincing impression of knowing just what he was doing. Chief Radar Engineer Jenkins watched with lively interest. He knew all the trouble-shooting tests the makers had listed in the maintenance book for the equipment. Now he saw them run through at twice the speed he could do them, and another series of tests begin which were not in the book. Magnus began humming in a tuneless way the doleful "Vecchia Zimarra" from Boheme, though probably no one, in or out of the opera house, would have recognised it. A corncrake might have responded, under the impression that its mate was calling. Compare the original 'Rover' cover to the 70's version at the top of the page. It's the same scene... things changed a lot in 16 years, didn't they? Now for 'Venus' - it took a real visionary to design a spacesuit out of sheet metal, and it's just as well they're not red or aliens might have tried to post their mail through the eye slots. Those tripod things are disrupters, they're designed to suppress the warlike natives. Pity they're powered with a hand-crank. Now that I knew of Martin Magnus on Mars, I discovered several new ways to not find a copy. I discovered ABEBOOKS and set up more searches (loads of Martin Magnus on Venus and Planet Rover, not a Mars to be seen). 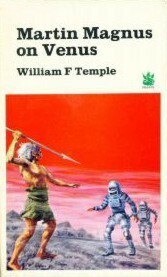 I got daily emails with new listings for all kinds of William F. Temple stuff, from fanzines to short stories to cheap US reprints with two William Temple novels printed back-to-back. But no Mars. I got nothing back from the usually reliable eBay. Either nobody has a copy, nobody wants to sell their copy, or nobody thinks it's worth listing an outdated, unknown old SF novel. So, plenty of the first two books but none of the third. All good searches come to an end, and I can now reveal the final chapter. In the past year I've been using Mozilla Firefox, and I want to explain how using this browser found my copy of Martin Magnus on Mars. Firefox, like Internet Explorer, lets you create folders in the bookmarks toolbar. Clicking one of these folders shows the favourites stored in that folder as a drop-down list. I keep one for 'Check Daily', another for 'Check Often', and several others for my frequently visited sites. In Firefox, unlike Internet Explorer, there's an additional entry at the foot of every list: 'Open in Tabs'. When you click this, Firefox opens all the links in that particular folder at once, using pages stacked on top of each other inside the main window. When I open my browser for a quick time-wasting session (perhaps half a dozen times a day) I click 'Check Daily', then 'Open In Tabs', then whizz through the pages to view any updates. Stuff like linuxtoday.com, slashdot.org, smh.com.au, afl.com.au, itv.com/f1 and so on. One of those sites (naturally) is a 'Martin Magnus' search on Abebooks. 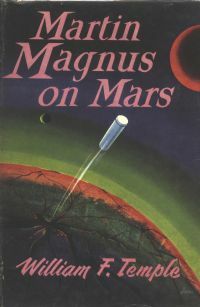 Day after day, time after time, it returned 'Martin Magnus on Venus' and 'Martin Magnus Planet Rover' on two distinct lines at the top of the page. (I should note that I don't restrict my searches to 'Martin Magnus on Mars' - If I did, and someone screwed up the title, it wouldn't show.) Last night (October 31, 2004) I checked my favourite pages one final time before bed, and when I saw 'Martin Magnus on Mars' listed as a third item under the familiar two entries I let out a shout which woke my kids, the neighbour's dog and half the people in my street. While the echoes faded, I sat and stared at those magic words. I got that order in, and tried to explain to my wife what was going on. I'm a writer, so the occasional giggle or howl is expected and acceptable, but I don't usually follow it up with strange dances around the lounge room. So I showed her my 'Martin Magnus' search, and slap me with a fantasy trilogy if the damned 'Mars' book hadn't vanished! Was it a figment of my over-active imagination? Had I been too late after all, and did those two seconds of stunned silence cost me my book? My wife, the sensible one (and computer programmer), said that it had probably disappeared from the listing because someone had ordered it. "Yes, but who got it?" I said. I received confirmation of my order 24 hours later. They even refunded half the postage because it's a lighter-than-average book. Within days, my copy of Mars will be here and then I'll be offline for at least 4 or 5 hours while I devour it. I don't care that the science is 50 years out of date or that the writing is a touch old-fashioned. For several hours I will be lost in my childhood memories, and the thrilling thing is that those memories will be new ones.